Iran said it has provided evidence to the United Nations atomic agency showing that documents on suspected nuclear bomb research by the country were forged and riddled with errors. In a statement to the International Atomic Energy Agency, it dismissed accusations that it is stonewalling an IAEA investigation into what the UN watchdog calls the possible military dimensions (PMD) of Iran’s nuclear program. Iran has offered detailed explanations to the IAEA and there has never been “any authenticated documents for PMD claims”, said the Iranian note posted on the agency’s website. It said Iranian officials had also given “pieces of evidence” during meetings in October and November indicating that documents shown by the IAEA were fabricated. They “are full of mistakes and contain fake names with specific pronunciations, which only point toward a certain member of the IAEA as their forger”, it said. It may have been referring to Israel or the United States, which have accused Iran of seeking to develop an atomic bomb capability. 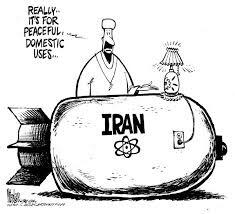 Iran says its nuclear program is aimed at generating electricity and that it is Israel’s assumed atomic arsenal that threatens peace.